The Kannapolis Intimidators (Low A; Sally League) have been sold, pending approvals, and the new owners have struck a deal for a downtown ballpark as part of a 30-year lease and a pledge to stay in the city. The new owners, Temerity Baseball, LLC, came to an agreement with the city on the $52-million facility, formally pitched as a Sports and Entertainment Venue. Last night the Kannapolis City Council approved construction of the ballpark and authorized the sale of limited obligation bonds for the project. With the financing in place, the city and the team are shooting for a 2020 opening. And the sale of the team still requires approval from the South Atlantic League and Minor League Baseball, as well as a review from Major League Baseball. “This is the right choice for Kannapolis. The momentum of this facility has already garnered commitments of $128 million in investments in our downtown including apartments, a brewery, restaurants, office space and potentially a hotel. We have spoken to hundreds of business owners and developers and we have heard repeatedly without the SEV this investment would not be happening,” commented Kannapolis City Manager Mike Legg in a press statement. Andy Sandler is an entrepreneur, investor, and strategic advisor to the financial services industry. He leads Temerity Capital Partners, the Sandler family office and private investment company, which invests in and advises early-stage companies developing new technologies in financial services. Andy is founder and Chairman of Treliant, the nation’s preeminent privately owned and operated financial services industry consulting firm; CEO and founder of Asurity Technologies, a software firm focused on providing automated compliance management solutions for the mortgage and banking industries; and founder of The Sandler Family Foundation, which focuses on impact investing and supporting social entrepreneurship. Andy also founded and led Buckley Sandler, a premier financial services law firm. The council also approved a 30-year lease with Temerity Baseball, LLC. These approvals include provisions that the team: will remain in Kannapolis, will continue to use Kannapolis in the team name, manage events/games, including concessions, maintain and make repairs to the facility, must operate a “first class” operation, split the costs of some utilities with the City, allow the City to use the SEV for eight events annually and have access to a suite, and give the City 25 percent of all concessions sold at City sponsored events. The team will pay the City $450,000 for the first three years of the lease and an increase of $35,000 every three years. The $52-million Sports and Entertainment Venue (SEV) will be located at the corner of West Avenue and Laureate Way. 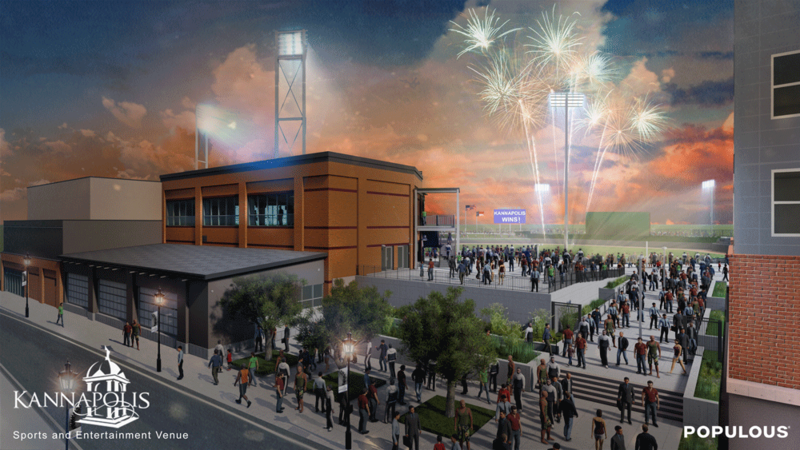 Construction will begin in October and will be completed in time for the April 2020 opening game of the Kannapolis Intimidators. The venue is designed to also be the home of various other activities such as concerts, a public park with restrooms, 6,000 square feet of event/meeting space, a kid’s zone and more. The ballpark will have a seating capacity of 4,930, with 3,218 fixed seats. 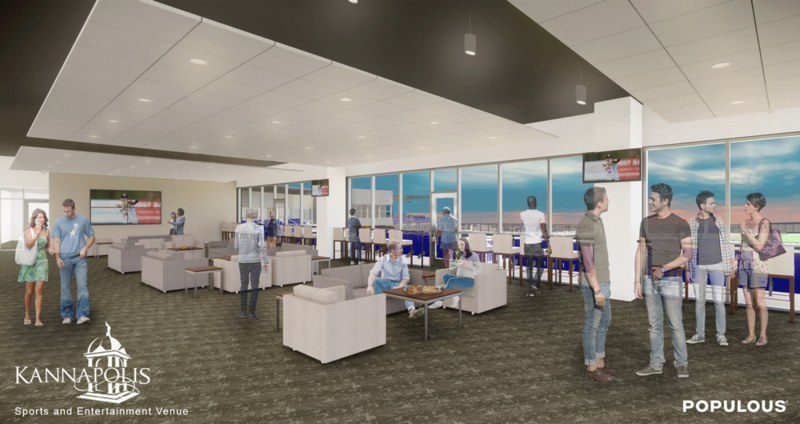 Other seating options will include luxury suites, a party deck, berm seating, dugout box seats, a picnic terrace, an outfield bar, right field boxes and 6,000 square feet of club/banquet space. Images courtesy City of Kannapolis.